Old Friend is back ! And my old friend the Trek 1000 died a few months when the headset decided to assplode on itself and threw pieces of it out of the fork area. Finally had the cash to fix the situation and I done it last week. Quickly threw on a pair of wheels and went down to one of the bike shops near my house while trying to negotiate through the roads with a hardly responsive bike. Reached there without any mishaps and went to select the headset. I had wished for a “indestructible” Chris King headset but my wallet was reading Cane Creek. So settled for the Cane Creek 110 instead. It was also the ironically, the same headset that i replaced on my Cervelo even though this one had a flatter top. So now I have 2 functioning bike. One for racing, one for training! 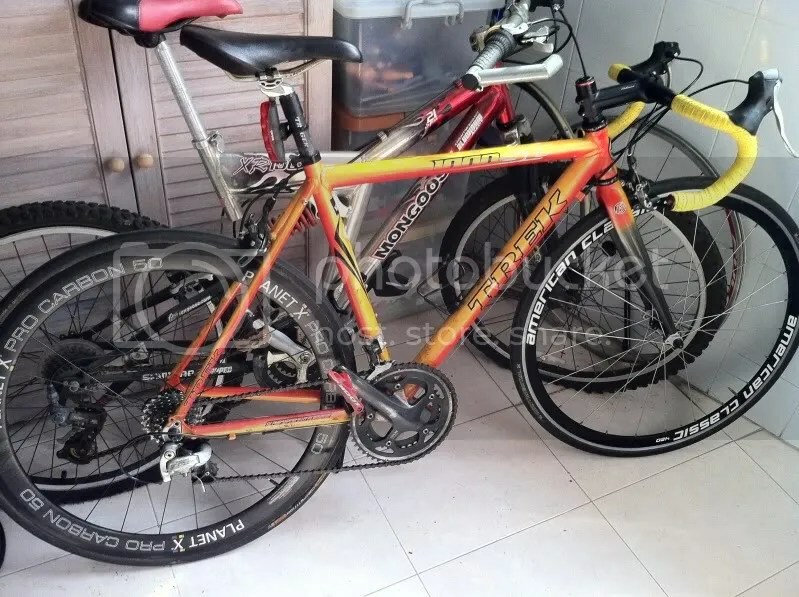 For friends in Singapore, If you always wanted to know how a road bike is like,feel free to contact me, I would be happy to lend you the trek. This entry was posted in Current Bike, Uncategorized and tagged bike shops, Cane Creek, old friend, Trek 1000. Bookmark the permalink.